This tawny-colored skipper has the long straw (proboscis) out for mealtime. 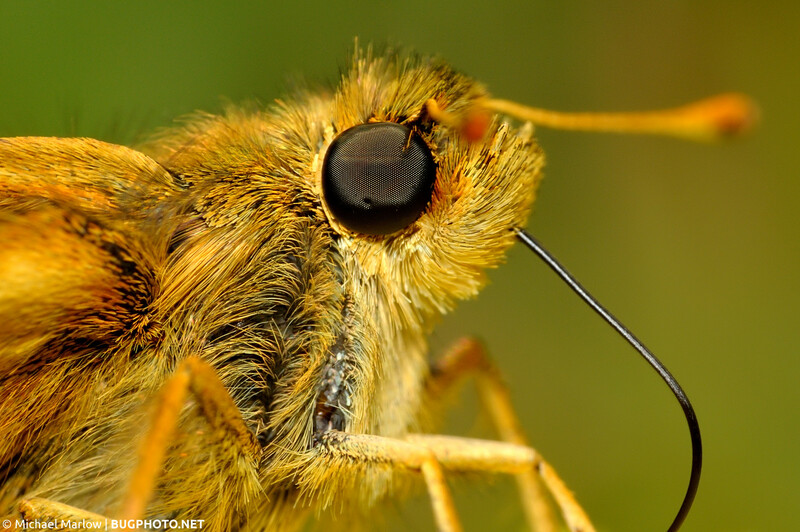 Skippers have a stout, stubby butterfly look to them. Or maybe an energetic, pretty moth vibe. Either way, I find them very attractive, endearing subjects. The one featured above has a particularly rich color to it, which is why I kind of think it’s a shame that the background conversely is a rather dull, uncomplimentary green. A background can make or break a photo – I’m not sure it did either in this case but I find it mildly deleterious. At the time, I was probably happy to have a somewhat well-illuminated background, as light fall-off constantly poses a problem in high magnification macrophotography, but now it falls a little flat. How does one get around a dull background? Shooting upwards at an angle can give you the blue sky background (obviously you need the blue sky to be out on that given day). While blue sky backgrounds can work spectacularly, they can also come out dull and poorly representative of the actual sky; the brighter the blue the better for me. Another way is to use colored cards or some other kind of artificial background. I have never really done this, but you see it a lot with extreme, high magnification focus stacks, as well as field shots, both with many examples of great success. I’m curious as to how the flash will bounce off it and affect the shot; it’s something I need to give a whirl. The trick with the artificial background, of course, is setting it up. I imagine it is difficult to employ with a tripod unless the subject is stationary. A handheld shot poses a problem of strength: can you one-hand the camera and other-hand the card without either interfering with the subject or shaking the camera too much. Of this method, I have known to be capable, as I occasionally do the essentially exact same thing with leaves, i.e. holding them up as a staged background with my offhand. Leaves present their own specific challenge as you have to make sure veins and other unwanted details are adequately blurred out of focus by adjusting the distance between the camera and the leaf, lest those details detract from the subject. A leaf’s “natural” greens and browns are a great cure for the “studio” black background that can get tedious fast. A couple other methods, which have their own pros and cons, are shooting with longer exposure times (typically without flash and with a tripod) or using secondary flashes to illuminate the background. Posted in SkippersTagged background, bug portrait, flash photography, Hesperiidae, light falloff, moth scales, proboscisBookmark the permalink. Great shot, great background. While I would never use a false background in the field, the easiest way to do would be with a plamp that is either a pole with a clamp on arm at the other end or like I have a clamp that attaches to the tripod with an articulating arm like a gorilla pod that can hold the background. My bet is an effort to use an artificial background risks scaring away every insect. Thanks! I haven’t used the cardstock or anything like that, but I do use leaves regularly, or periodically at the very least. I think some would be surprised how close you can get to bugs without scaring them off. Of course it depends on the type of bug and it depends on what they are doing at the time. A feeding insect tends to let down its guard, in my experience; a spider with prey is less likely to run for the hills (although if they can carry the prey easily all bets are off!). A dragonfly at midday on the other hand is hard enough to get in front of, forget holding something behind it at the same time. Of course, it requires a lot of patience, of which sometimes I think I am quite rich in supply, or at least perhaps it would appear to most – other times I feel like patience is the most foreign concept I could imagine. I am also used to a very short working distance and take tons of shots, so perhaps my experience is a bit skewed. But it can be done! Whether it is desirable, of course, is to one’s tastes. Re: the plamps, I saw an interesting homemade contraption devised of two gorillapods fused head to head and clips/clamps added to the end of each of the upward pointing legs. It was used for stabilizing plant substrates and surrounding vegetation for early morning stacks and looked pretty effective. I would love to see a video of you taking a shot. You’ve got to be fast. Those insects don’t hang around very long before they’re gone. It sounds like you don’t even use a tripod. Your macro must have a quick focus, and you’re probably ‘wide open’ to blur the background, so you’ve got to be right there with the focus perfect. I could consider getting a body (not myself) and then buying a macro lens I suppose, but that starts adding up. Hi Pat, yes I very rarely use a tripod; it’s mostly handheld work from me. The real secret to my success is that I take A LOT of shots. My set up is also mostly manual, i.e. I have to set everything myself, with maybe the exception of Auto White Balance (which is usually OK). My focus is “manual” but actually what I do is move the whole camera forward or backward. Keep in mind that my work is also dependent on using a flash; I just can’t get these results doing handheld without them. Your focus problems might be helped by a wide angle lens, but it is going to depend on how high of a magnification you are going for. I will work on getting a post up about my process with photos and (hopefully) a video; I’m sure it would be more useful than just the words. Okay, the flash probably helps a lot, but you probably have steady hands too. I never thought about using a flash because most the time I shoot video. Manual focus? Is that on a digital camera? That’s why you move the camera in or out to get it right? I wonder if I can do that on my small camera. To get the video to focus now, I’ve got to set it to ‘still,’ let the camera focus, then start my video…a time consuming effort when you’re trying to shoot a video of a bee.